This is the second in our series of the buses featuring the Go South Coast Company of ‘Wilts & Dorset’, but will be the last using that name. Wilts & Dorset has rebranded their bus fleets - those in the Salisbury area being ‘Salisbury Reds’, and the rest of the fleet are now branded as ‘more’. The ‘more’ brand was introduced back in 2004 for the high profile routes running between the two main towns in the operating area of Poole and Bournemouth. The name and a revised livery is now being introduced across the whole fleet, eliminating the ‘Wilts & Dorset’ name, which was first used one hundred years ago in 1915. The filming on this video programm e began in 2012 when the Wilts & Dorset name was still a major feature on the buses and continued through to 2013 and 2014, recording the transformation of the vehicles over this time span. We have concentrated on the main centres of operation along the south coast that the erstwhile Wilts & Dorset fleet has been a feature of over the years. At some locations we have used two cameras to give you the best view of the buses in service. We start in 2012 at the Sandbanks Ferry and see Scania OmniCitys with their Optare Visionaire bodies boarding and leaving the famous chain ferry as they operate between Bournemouth and Swanage in their smart dedicated livery of blue and lime green. We then record the buses running around Swanage, and pay a brief visit to the steam railway in the town. 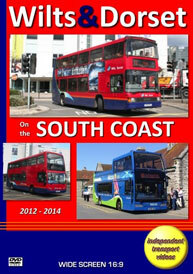 Poole is our next location where we see the very busy bus station in April 2012 and May 2013. Our footage includes Bournemouth Yellow Buses, First buses and Go South Coast subsidiary Damory running alongside brand new Wright single deckers and middle aged Optare Spectra doubles deckers, to name but a few! We then head east to Bournemouth for two visits, one in May 2013, the other in September 2013. On the latter we see newly into service Enviro 400 double deckers, branded for the X3 service between Bournemouth and Salisbury. These have just displaced the Scania OmniCity N230 UD double deckers of which we see some now on local services still branded as X3, and one in the Bournemouth University livery of pink and white. Our next location is the market town of Ringwood, where there is a good deal of interest, including a number of National Express arrivals and departures. This filming was done in April 2012. Our most eastern venue on this programme is Lymington. This visit was made in February 2014, and we see some of the arrivals and departures in the small bus station, which is situated in the High Street. To conclude this visit to the south coast we move inland to Blandford in April 2012, another market town that was served by Wilts & Dorset and Damory at the time of filming. We record the busy afternoon scene, which includes a DAF SB220 with Ikarus CitiBus bodywork operated by Damory, and previously operated by Wall’s of Manchester. Our programme concludes with some archive video from the cameras of Malcolm King filmed in 1989 and of Joe Ward filmed in 1990 and 1992. These feature buses running in both NBC poppy red and white and the first deregulated livery of red, white and black. Enjoy your visit to the south coast!